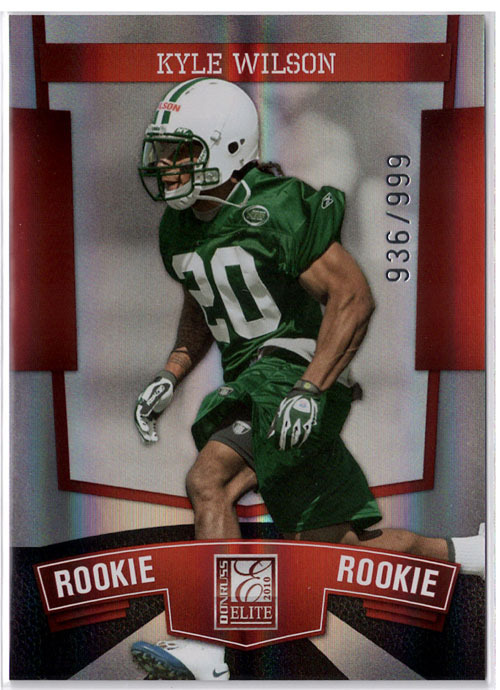 Bottom Line: There might not be a more underrated parallel in all of cards than Elite's "status" and "aspirations" die-cuts. Low numbering, frequent auto's, and sharp card design make them the best die-cuts in the business. They also appreciate in value extremely well. 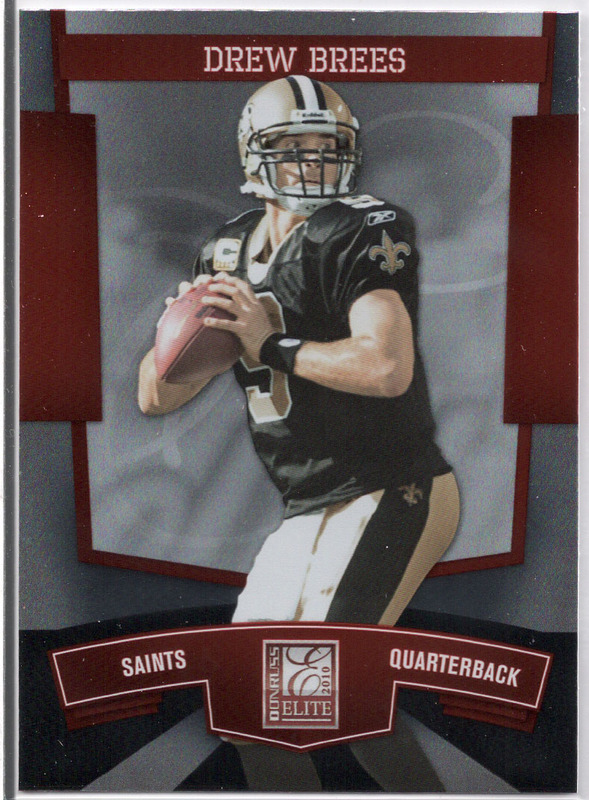 Outside of the "status" and "aspirations", 2010 Donruss Elite Football is surprisingly weak. 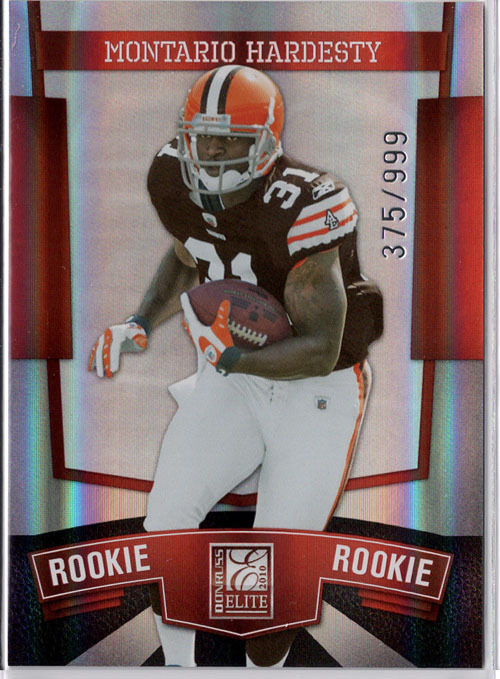 The NFL Shield Rookie Auto's feature on-card auto's of big name rookies like Tebow, Bradford, Bryant, and Clausen, but they have an extremely generic feel to them. 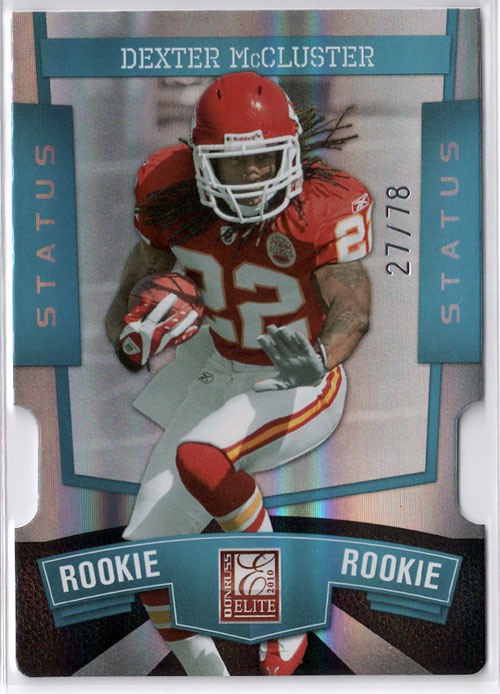 Overall, the 2010 incarnation of Elite is an slightly above-average football product. I am shocked that I am about to say this, but Prestige might be a better overall product than Elite this year. 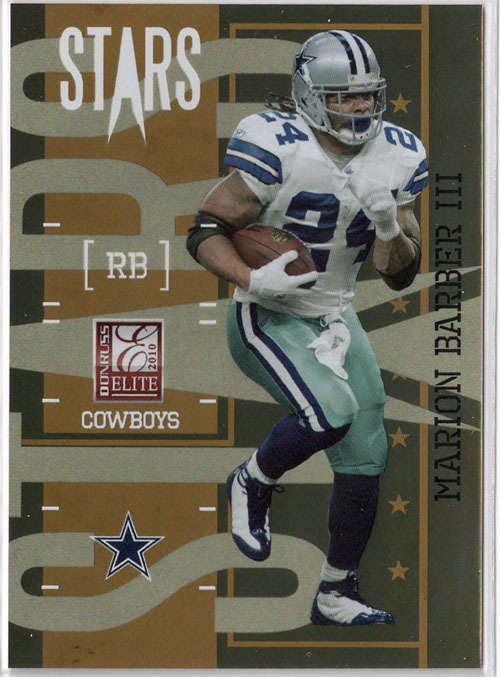 If you are all about the "Status" and "Aspirations" die-cuts, than Elite has plenty to offer you, but if that's not your bag, than I would suggest going with the lower box priced 2010 Prestige or holding out for the August release of 2010 Rookies and Stars, which looks awesome. The "Status" and "Aspirations" die-cuts are sharp looking as one would expect, the foil-board base cards are also great looking per usual. 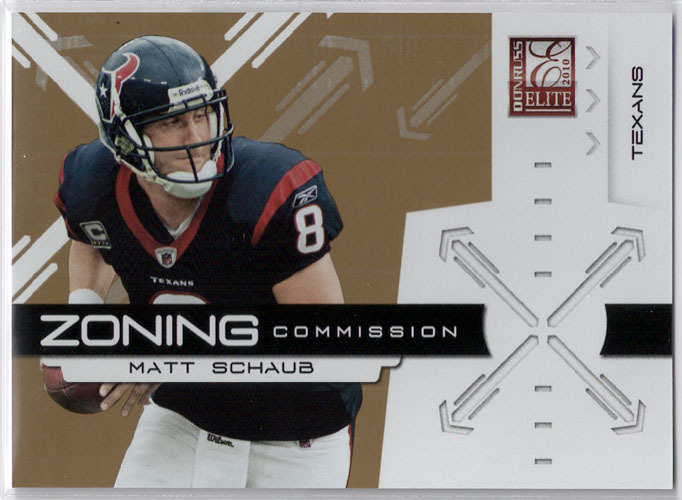 Unfortunately, the rest of the cards in 2010 Elite leave much to be desired. Sticker drop auto's on foil-board always look ugly, it makes you wonder when Panini is going to address their sticker drop issues, for whatever reason Topps and Upper Deck do a far better job with them. Another issue I had with the design revolved around the overall color scheme of the product. Individually, the colors seems to fit each card, but when you sort through a loose stack, the colors don't mesh well at all, creating a creepy cornucopia of odd colors. The checklist delivers everything you could ask from a mid-summer football product. 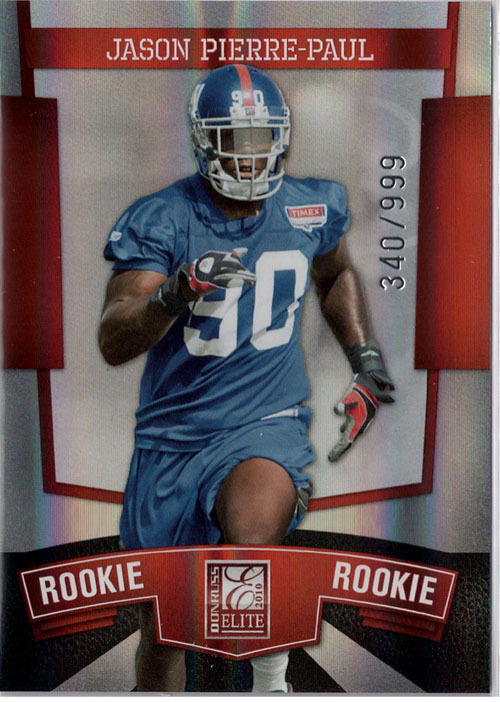 All of the requisite rookies from the 2010 NFL Draft Class are present and there are some pretty cool veterans cards. 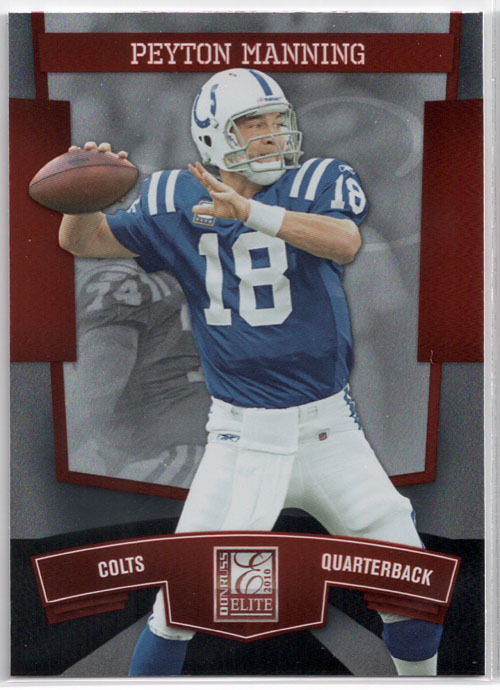 The only real complaint I have with the checklist is in the inserts, there are too many undeserving players included and some players feel like they were mistakenly placed into the wrong insert set. 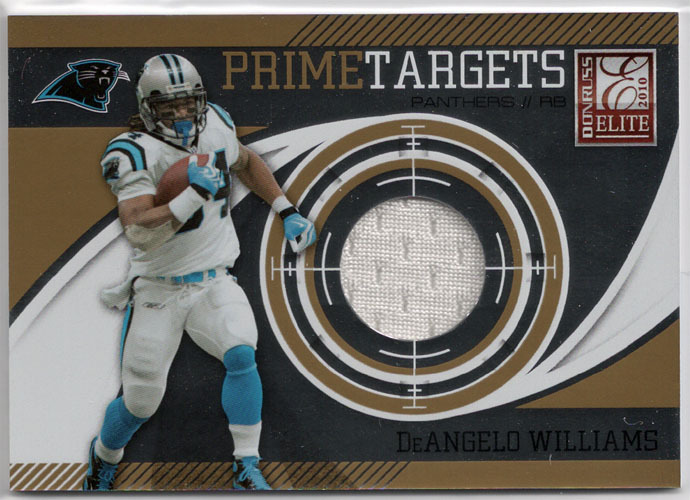 A perfect example of this is the "Prime Targets" Jamal Charles insert I pulled. 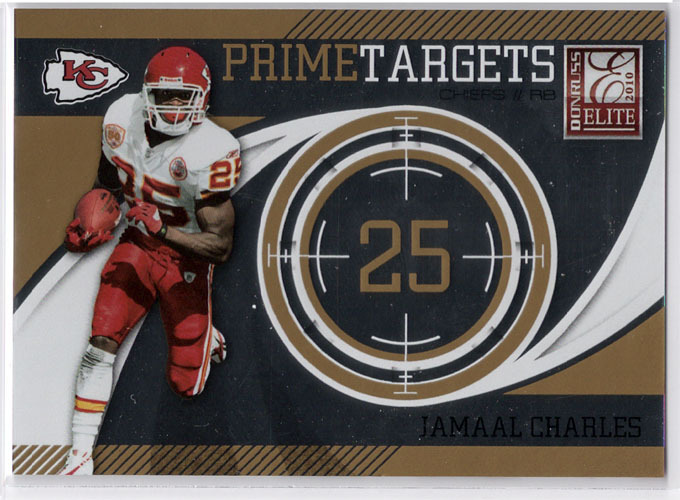 First off, do we really need a Jamal Charles insert card? Second off, Charles is running back, not a receiver or even an elite pass-receiving running back. 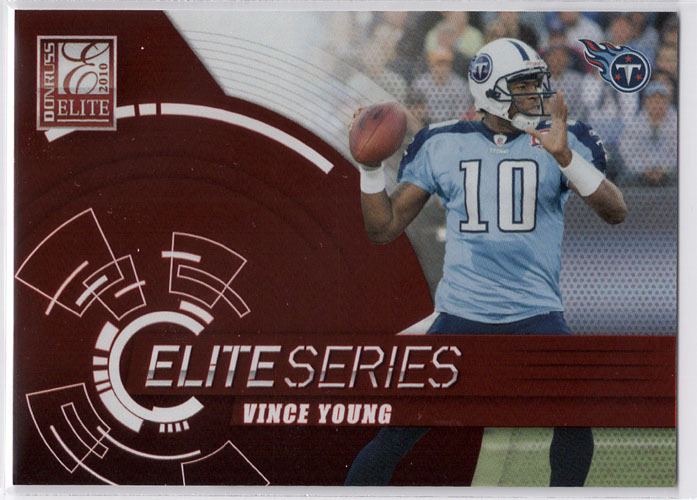 The value of Elite almost entirely lies in the "Status" and "Elite" die-cuts. You would be shocked at how well these retain value. 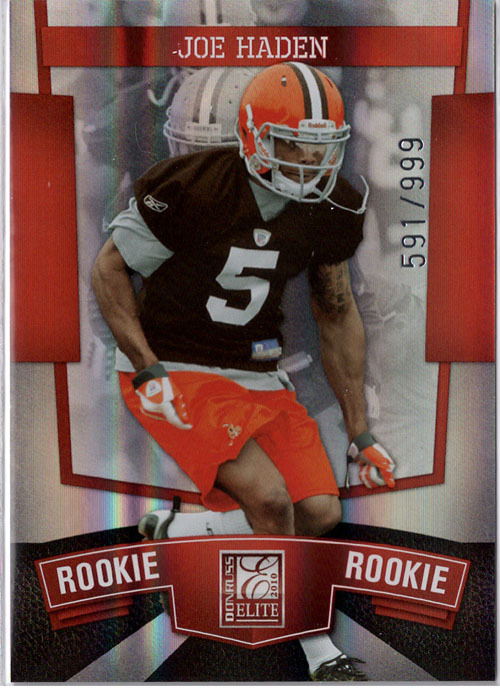 I have a friend who speculated on Julius Jones several years back and the only card that surived Julius not living up to the hype was a 2004 Donruss Elite Status, which still books at close to $80! If Elite had a consistent box price of less than $100, I would give it value of 4/5, but with a box price of over $100, it's a lot more difficult to break even breaking a box. 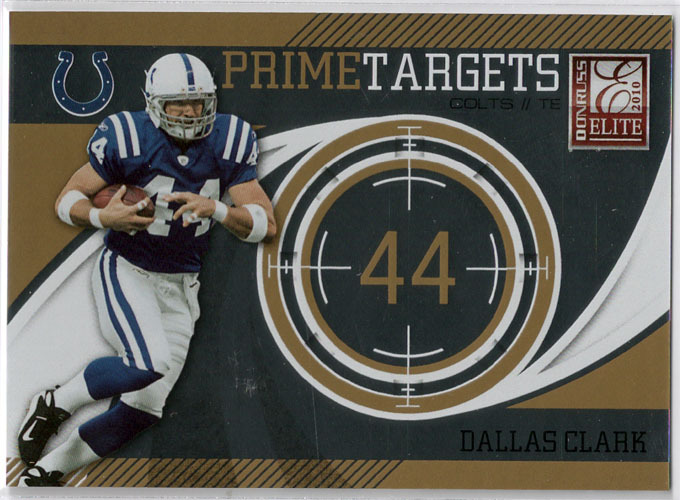 2010 Prestige is a much better bang for your buck product than Elite is. 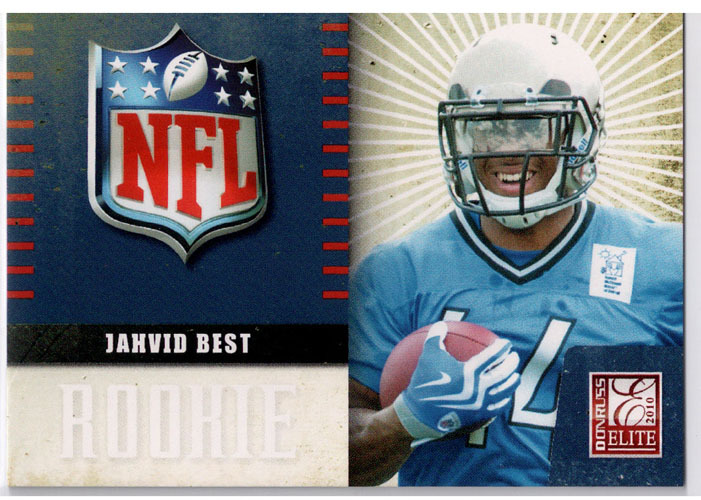 If you're all "Prestiged" out, I would suggest holding off until 2010 Rookies and Stars releases. I think Rookies and Stars is really coming into it's own and has a growing following. 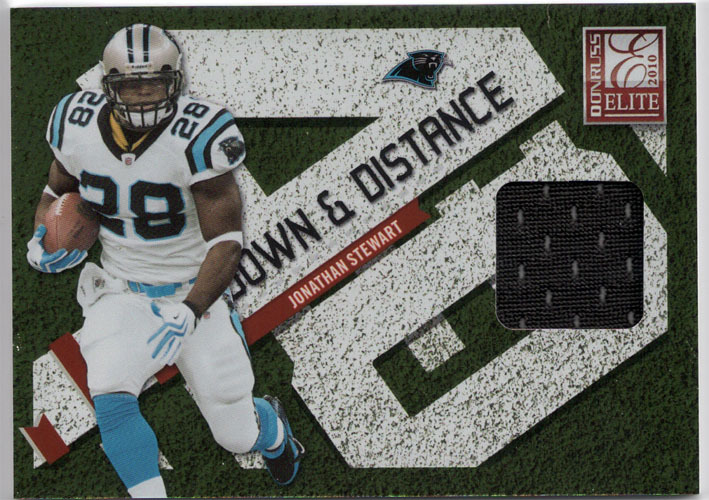 As a fan of the "Status" and "Elite" die-cuts, I probably enjoyed opening this product more than most, even still, I couldn't help but feel like their was something a bit "off" and less exciting than usual with 2010 Donruss Elite. I can't put my finger on it, but it just didn't generate the usual enthusiasm that accompanies an Elite release. I guess it just didn't live up to my pre-box expectations. Product Configuration: 20 packs per box. 5 cards per pack. 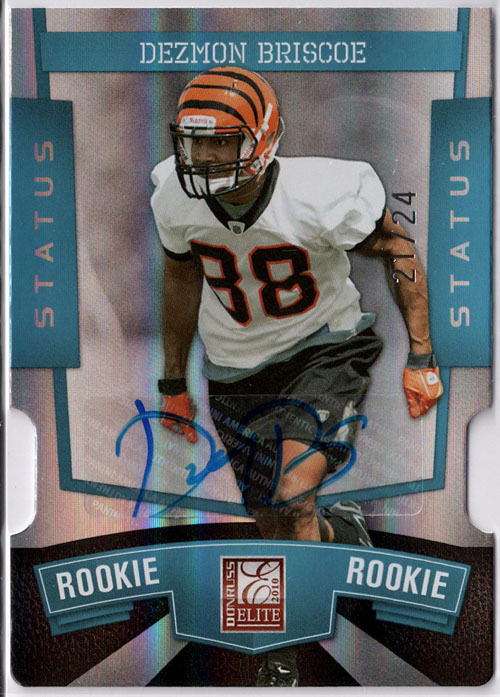 Top 2010 NFL Rookies With Autographed Parallels # to 499 Or Less! 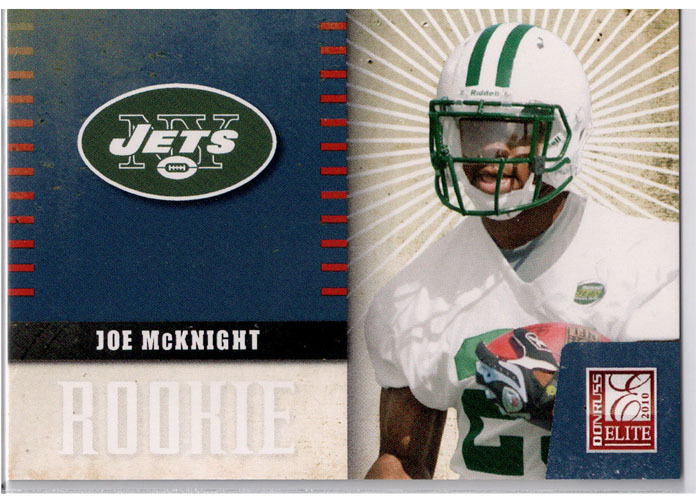 Rookie NFL Shield and Team Logos Featuring Parallel On-Card Autographs! Passing The Torch and Throwback Threads Dual Autograph Cards! 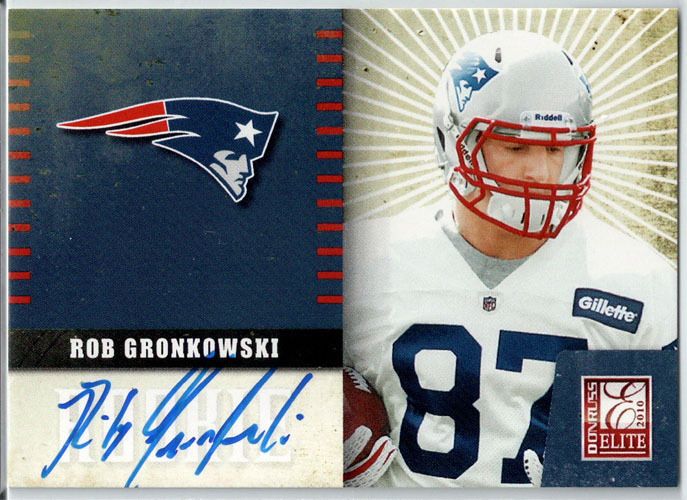 Super Bowl XLIVAutographs And Material Cards! This product in my opinion was not as good as it has been in past years. 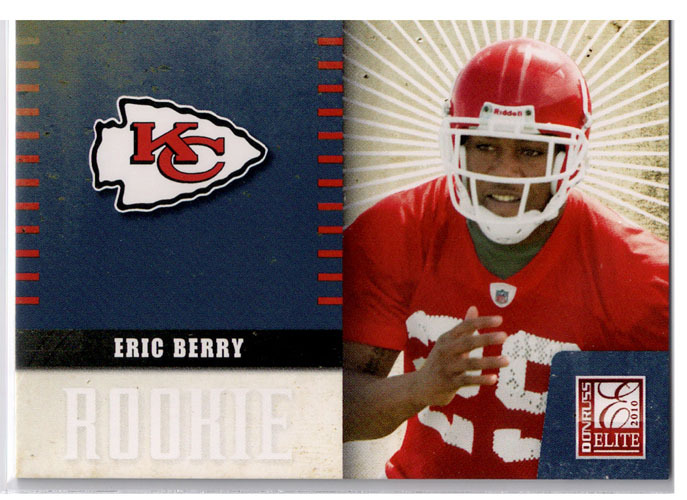 I got some good hits and nice inserts out of my box but for the price I felt like it was somewhat lacking. 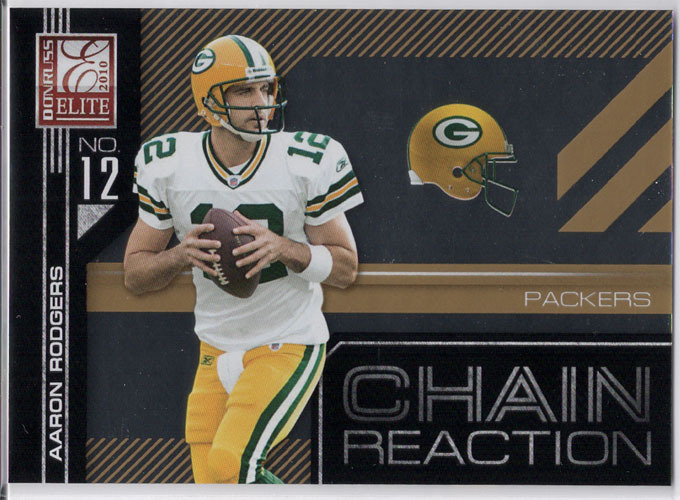 It is a solid product that usually yields some nice cards although I feel like it is overpriced. I give it a 3 out of 5.